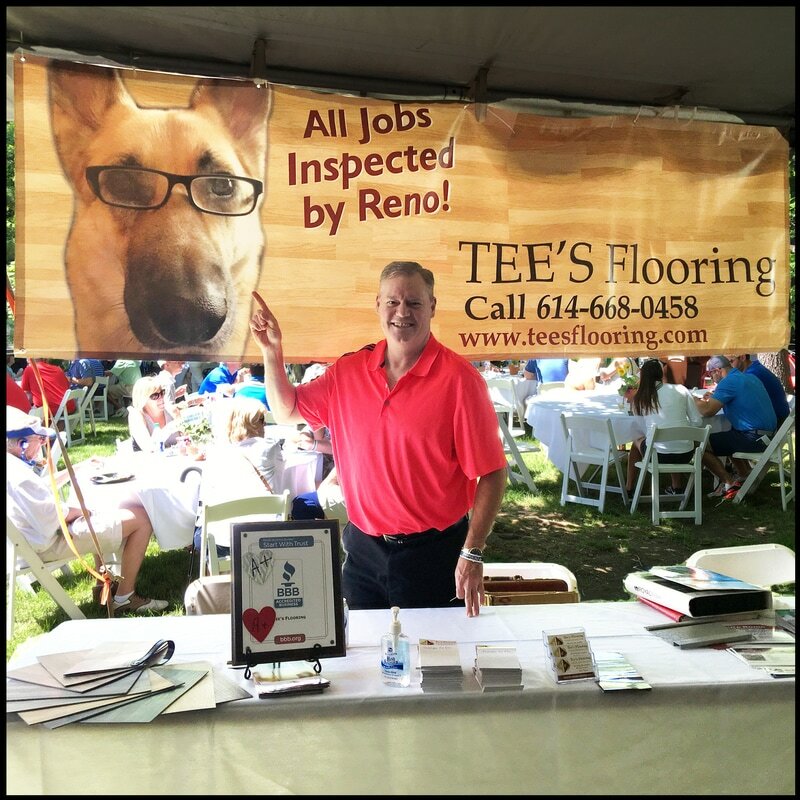 Tee's Flooring is a long-time exhibitor at top events in Central Ohio. 2017 is our 4th year at the Memorial Tournament and 9th year at the Home & Garden Show. Come out and meet us at one of these events, or give us a call today! We'll bring the samples directly to you. 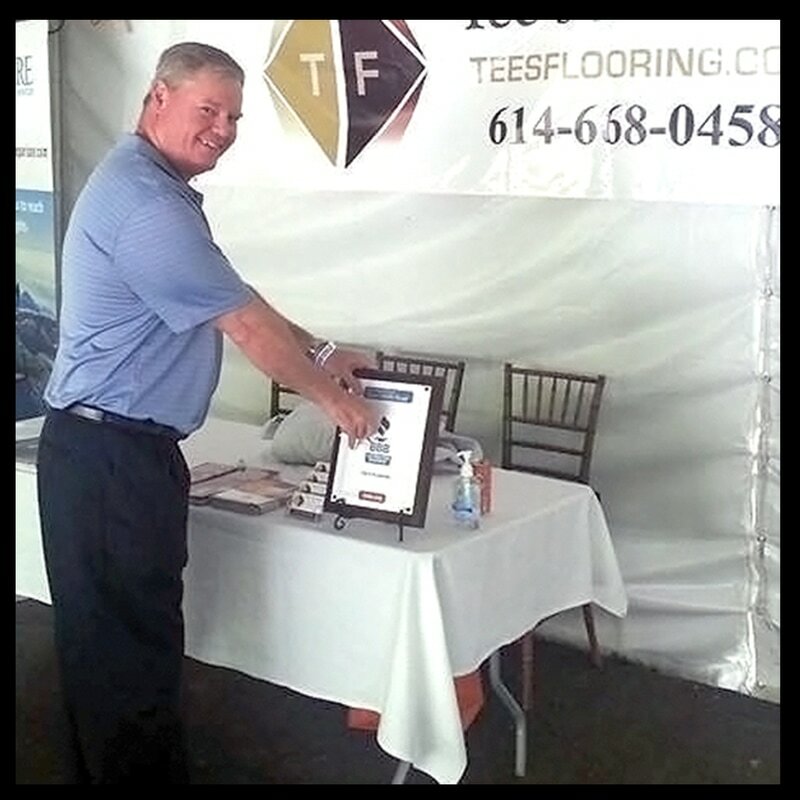 At the Memorial Tournament: Owner Tony Tipton shows the Tee's Flooring booth. 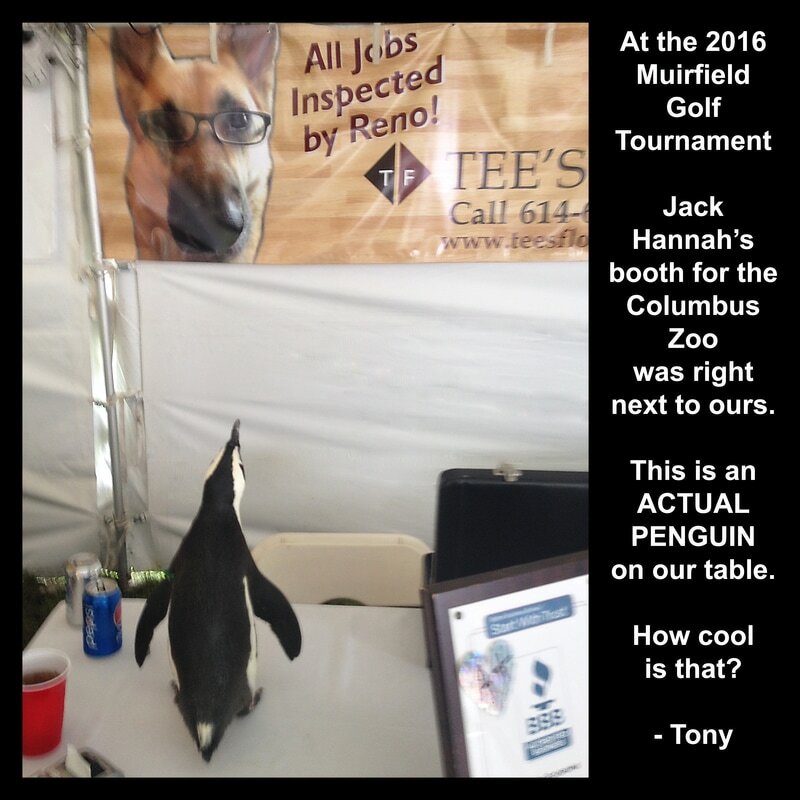 Yes, a real penguin visited our booth at the Memorial Tournament. She seems to like Reno! The Tee's Flooring booth is once again in Party House 7 on the 7th hole. Visit to learn about our flooring and general contracting services straight from Tony Tipton, Owner / Founder of Tee's Flooring. This is our 4th year to have a booth at the Memorial Tournament at Muirfield Village Golf Club, and we love it! There's more-- The Columbus Zoo is in Party House 7, too! They raffle a car each year and keep things exciting. In 2016 Jack Hannah came out on Thursday and Friday with different animals each day. People took pics and got autographs. It was really cool. There was an actual penguin ON. OUR. TABLE. That's by far our favorite pic of the event. It can be difficult to get access to this party house. It's sponsored by AmeriFinancial if you have connections there. Tee's Flooring can obtain a limited number of tickets for our customers. A five day pass is $280 and single tickets are $80 this year, 2017. This does not cover tickets to the tournament, but does include all food and drinks served in Party House 7. Call 614- 668-0458 while supplies last. We hope to see you at the tournament this year! The Home & Garden Show is Columbus, OH's premiere event for homeowners. If you're looking for well-vetted, reputable home improvement companies for indoor or outdoor projects, this is unquestionably the best place to find them. 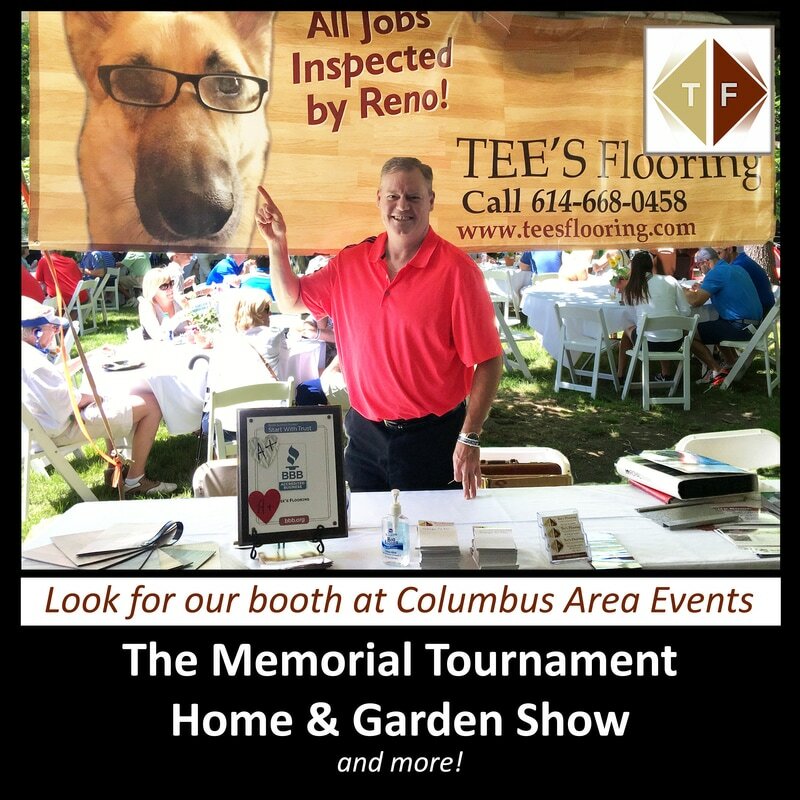 2017 is Tee's Flooring's 9th year as a Home & Garden Show exhibitor. We usually participate at both the spring and fall events. If you haven't attended before, you're one of the few! The Home & Garden Show is a crowd draw, and truly a must-see. Many exhibits are fully built-out environments landscaped with plantings brought in just for the show. It's quite a spectacle! Come in and see the Tee's Flooring difference! Every member of your family will love our results. Installation & general contracting with expert craftsmanship. 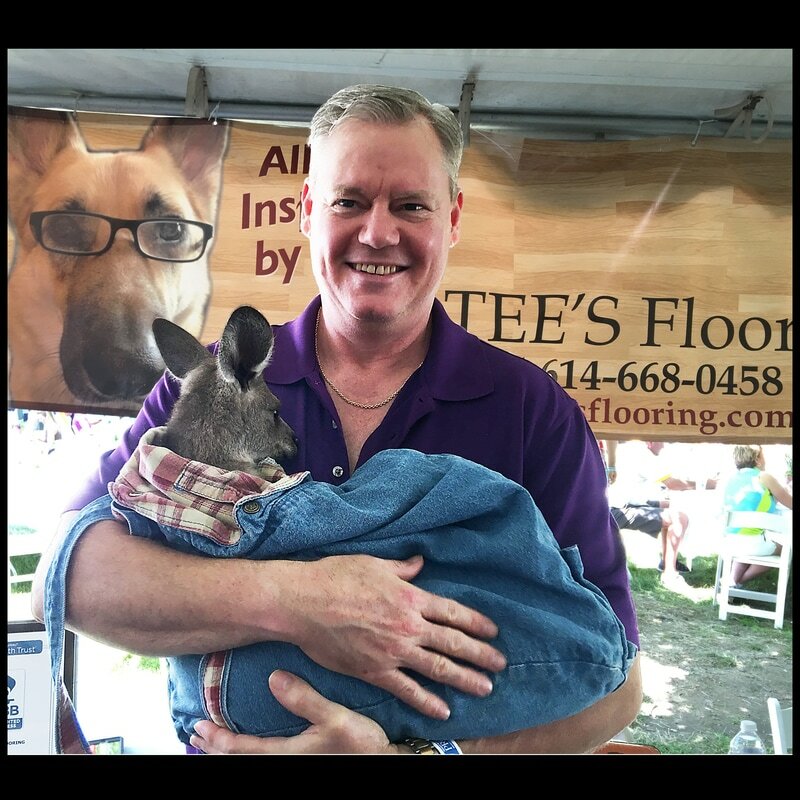 Owner Tony Tipton started in the flooring business in 1994 and quickly began consulting for top local flooring companies like Floor Play Ceramics, B&B Carpet Consultants, Henson Flooring, and Walberry Tile & Marble. In 2003 he partnered with Terry Henson to operate a store front in Johnstown. When the economic downturn hit the housing market in 2005, Tony realized customers needed a price break on flooring and general contracting projects. In response, he opened Tee's Flooring with a full service, customer-centric business model that runs smart and lean. We save both money and time – YOURS. 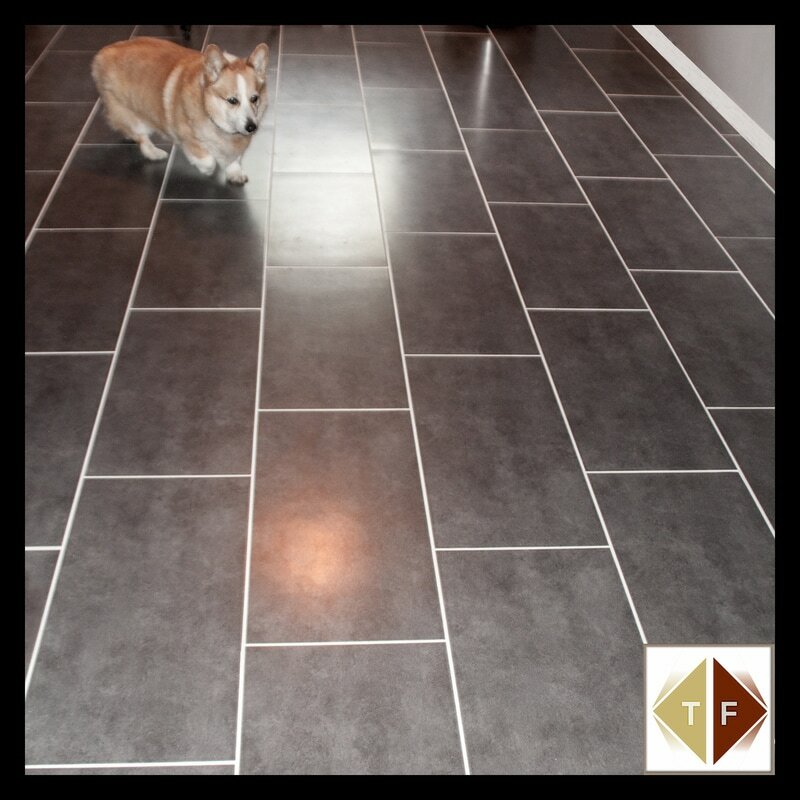 At Tee's Flooring we've eliminated the cost of operating a brick and mortar store. We're able to leverage our strong relationships with multiple distributors to get you the best price and selection. And we bring the samples directly to you. WE BRING THE SAMPLES DIRECTLY TO YOU!